The decor is traditional, with a patterned carpet, padded church pew seating, blocky bar stools all along the bar, and heavy curtains at the windows. There's at least one high table, but plenty of normal-height seating too. A fireplace at one end is in use at times, according to the 2012 Good Beer Guide. There are at least three flatscreens and at least one normal TV. There's a garden too, which according to the 2012 Good Beer Guide has play equipment for children. 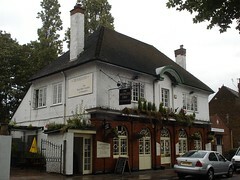 A sign seen in the pub in September 2011 warned that children are welcome until 7pm only. Kake visited on a Tuesday afternoon in September 2011. There were a couple of other customers in. Sky Sports was showing silently on at least three of the screens, and music was playing on the radio (Absolute 80s, "the UK's only 80s music radio station") at a moderate volume. Three real ales were available: Downton All Rounder (£1.70/half), Young's Bitter, and Bishop's Finger. The All Rounder smelled and tasted sour, but the member of staff on duty told me that the barrel had only gone on the night before and that this particular ale is known to be an "acquired taste". She happily gave me another ale in its place at no extra charge. According to a sign seen outside in September 2011, food is served lunchtimes only, 11am-2:30pm Mon-Sat (though a menu seen on the same visit contradicted this, stating that weekday lunch starts at 11:30am). It's fairly standard pub food: sandwiches, panini, jackets, burgers, pies, and things with chips. Accessibility: A small step and then a 90-degree turn at the side entrance; bigger step at front entrance. Once you're in, it's step-free to the bar, seating, and ladies' toilet (not sure about gents;). A couple of steps to the beer garden. Last visited by Kake, September 2011. Opening hours taken from the 2012 Good Beer Guide. Last edited 2013-05-10 08:18:38 (version 3; diff). List all versions. Page last edited 2013-05-10 08:18:38 (version 3).